On Thursday of this week the Bank of England makes another Bank Rate decision which I fear will be a repeat of the last year which is a hold at 0.5%. Additionally, we are now getting close to an election so I thought it a good time to stop, take a step back and just look at who the winners and losers are of the current government and Bank of England decisions in the lead up to Thursday. 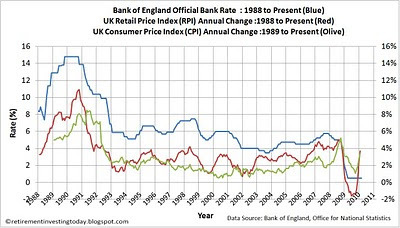 From the start of today’s chart dataset in 1988 until 2008 the Official Bank Rate has always been above the consumer price index (CPI) and retail price index (RPI). Since 2008 it has now slipped below both inflation indexes by a significant margin (2.9% and 3.2% respectively). Before I look at why I think this helps spenders let’s first look at the Official Bank Rate is? Simply it’s the interest rate that the Bank of England charges financial institutions (aka Banks) for secured overnight borrowing. To me the decision by the Bank of England to have rates below inflation sends a clear message that borrowing is good and saving is bad. So if I’m a bank I can in theory (dependent on required margin and risk cover) borrow from the bank of England at 0.5% and still lend out at a rate close to or below inflation. Why do the banks need savers with this lark? If I’m borrowing at below inflation then this encourages me to borrow as much as possible now as tomorrow the item I wanted to buy has increased in price by more than the cash I had plus interest charge effectively giving me free money. Even if I’m borrowing at a rate above inflation I’m far better off (my delta between inflation and interest rate is lower) than if the Official Bank Rate is well above inflation as should be the case. Additionally what I think the Bank of England might be trying to encourage is to get banks to take on riskier loans where they have to make more margin to protect against defaulters plus also allow them to make more margin. As a bonus the Bank of England can also punish the poor saver who is then encouraged to spend money rather than to save money which is declining in value. This sounds dangerous to me and could lead to yet more booms (followed by busts) in the future.